Mary von Rathen is maybe the biggest mystery of the Obscure Cities. We learned about her mysterious leaning problem in L'Enfant Penchée and we know she became an investigator of Mysterious cases in La Théorie du Grain de Sable. But her meeting with Augustin Desombres was not the only connection she made with our world, several people were contacted by Mary via letters and email. This is a developing story about Mary von Rathen and her mysterious letters. Check back often for more details about the Mystery of Mary. If you have any additional information about Mary von Rathen please contact us via e-mail to [email protected] or by mail to “Joseph le Perdriel, Mooienhof 301, 7512 EE Enschede, Netherlands”. All information is welcome. Feel free to send your information in French or any other local language! Mary von Rathen is the daughter of Klaus von Rathen and Rosa Schliwinski, born in 736 AT. At the age of eleven, she mysteriously fell under the influence of another world and her gravity axis took a new. After three years performing in the Robertson Circus under the stage name Laetitia 1), she took off in 751 AT with Wappendorf for the planet Antinea. They landed in the antechamber of the Spheres, where Mary met Augustin Desombres, with whom she fell in love 2). Once “straightened”, she inherited the ruling powers after the death of her father, and endeavored to bring social reforms to Mylos, while trying to get Augustin to find a way to bring her to our world with the help of Robick and Wappendorf. She eventually managed to do so around 769 AT, thanks to Vigoleis Koelber, and worked in a small dry cleaning shop in Metz during her stay. In 784 AT she visits Brüsel to investigate the strange events that are happening in Brüsel after the death of Gholam Mortiza Khan. She is working as a colector of strange phenomenons together with Constant Abeels 3). Afterwards time lines becomes unclear. On several occasions letters were found that are supposedly to be written by Mary. In August 2015 we got a copy of three letters send by Mary to Eddy Remy. Eddy Remy is the author of Dictionnaire des Cîtés Obscures of which only 10 copies exist. He was known as a collector of Obscure Cities related material. Eddy Remy sold these three letters as part of his Les Cités Obscure collection on Ebay. In 2011 the letters became part of the collection of another collector Jean Marc Tur. The addition of the letters to the Altaplana archives, triggered this investigation. Besides the three letters there was an newspaper ad. The classified ad was supposedly to be published in the Belgium newspaper Le Soir. We checked the online archives of Le Soir and found out that the classified ad was published on March 20,1990 4). But about the letters he couldn't remember anything: “I don't have accurate informations about that … actually I don't remember anything about that …”. According to himself: “I'm so old and so tied … and it's so far in the past …”. If Remy can't help, maybe Le Soir can. When we searched for “Desombres” in the archives of Le Soir we found the first mention in an article by Robert Rouyet on February 21, 1990. 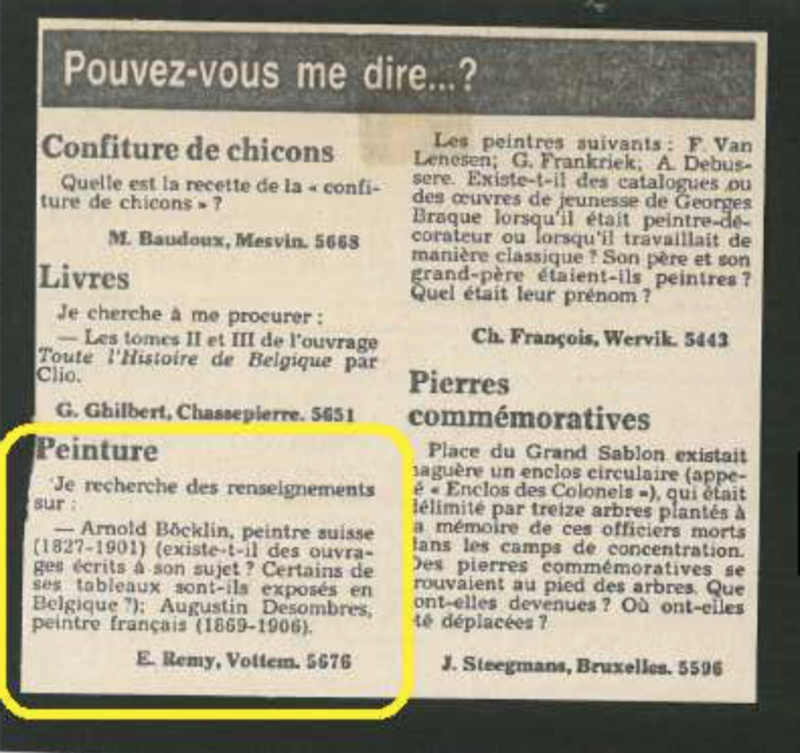 Rouyet mentions the release of a compact disc titled Le Musée A. Desombres, the story about the unknown painter Augustin Desombres, whose painting sell for a lot of money on auctions. There is a small play on words in that title: said aloud in French, it sounds like “The Museum has Shadows”. This is appropriate, because this particular album started as a traveling cartoon exhibit called Le Musée des Ombres (the Museum of Shadows). You can read the article Je me souviens du Musée des Ombres by Thierry Groensteen with more information about this exhibition. Le Musée A. Desombres tells us that Desombres became friends with Mary von Rathen and that Mary tried to find a way to visit our world. On July 25, 1990 Eddy Remy received a reply by letter. The letter was send to Le Soir and was signed by Mary von Rathen. The letter was post stamped “12 La Cavalerie Aveyron”. La Cavalerie is a small town in the Aveyron region 5). Aveyron is the same French district where Augustin Desombres found in Laguiole a vacant building that became his museum. The letter by Mary has two pages. The letter is not dated nor a location is mentioned. Le Soir added the arrival date and reference to the ad by Eddy Remy to the letter. There is one day between the postmark and the date added to the letter. The letter is written in blue ink. It looks like the ink was running out, as some words are redone by another pen. It is unknown who did this and if it was Mary, if it was done intentionally. But it is curious that “prétendaient sait pas” (pretend not to know) are the words in a different ink. Or download the PDF scan of the first letter. We have asked Aloyzia_X to transcribe and translate the letter. Je le revois encore, avec ses grandes moustaches rebiquées et ses cheveux mal peignés dès qu'il a su où il se trouvait, il a immédiatement désiré explorer ce monde qui lui était inconnu. Je l'ai présenté à mon père qui fut vivement intéressé par l'homme et par le lieu d'où il venait. Mais maintenant que je suis moi-même passée, je me rends compte qu'il avait tort. Ceci dit, Augustin visita plusieurs cités du continent. Il peignait tout le temps. D'ailleurs, on peut voir quelques-uns de ses tableaux exposés à la Fondation Freddy de Vrouw de Brüsel. Il était avide d'histoires étranges et écouta plusieurs fois Robick et Wappendorf raconter leurs “aventures”. Certains prétendaient qu'il m'aimait, et il le disait aussi. Je crois surtout qu'il aimait mon visage: il voulait le peindre mais il n'a jamais réussi. Il est, un jour, parti pour une cité qu'il ne connaissait pas encore (Samaris, Blossfeldtstad ou Samarobrive ? Je ne sais plus) et il n'est jamais revenu. Robick et Wappendorf étaient certains qu'il était retourné dans son monde et ont voulu l'attendre chez moi Ce qu'il est devenu, personne ne vous le dira. Mais tout cela est de l'histoire ancienne, et maintenant que je suis en ce monde, une nouvelle vie m'est offerte et, tout comme Augustin, je suis fascinée par ces civilisations que je ne connaissais pas. Voilà tout e que je puis dire concernant Augustin et, excusez-moi mais, la remémoration de ces souvenirs m'a quelque peu fatiguée. Je vous encourage, toutefois, à persévérer dans votre recherche. Si vous avez quelque renseignement concernant Augustin, transmettez-le moi, cela m'intéressera. D'avance, je vous en remercie. Your classified ad just came to me through Mister Peeters, whose works you might know. About Arnold Böcklin, I will not be able to say anything. On the other hand, I have know Augustin Desombres very well since he came five times in my Mylos estate. I still see him, with his big unmanageable mustaches and is hair not groomed since he knew where he was, he immediately wanted to explore this world unknown to him. I introduced him to my father, who was vividly interested in this man and the place he came from. But now that I have passed through too, I realize that he was wrong. That being said Augustin visited several of the continent cities. He painted all the time. Incidentally, we can see some of his paintings exhibited at the Brüsel Freddy de Vrouw foundation. He was keen for strange stories and listened to Robick and Wappendorf tell their “adventures”. Some pretended he loved me, and he said so too. I believed he mostly loved my face: he wanted to paint it but never succeeded. He went, one day, for a city that he did not know yet (Samaris, Blossfeldtstad or Samarobrive? I do not remember) and he never came back. Robick and Wappendorf were certain he went back to his world and they wanted to wait for him at my place. What he became, nobody will tell you. But all of this is ancient history, and now that I am in this world, I have been gifted a new life and, just as Augustin, I am fascinated by those civilizations I did not know. Here is all I can say about Augustin and, excuse me but, the remembrance of these memories somewhat tired me. I encourage you, however, to persevere in your research. If you have any information about Augustin, hand it to me, it will interest me. In advance, thank you. The letter contains references to subjects of the first published albums about the Obscure Cities but also to subjects that are only mentioned in albums published later on. When we return to the envelop and take a look at the return address it give an address in Metz, France. 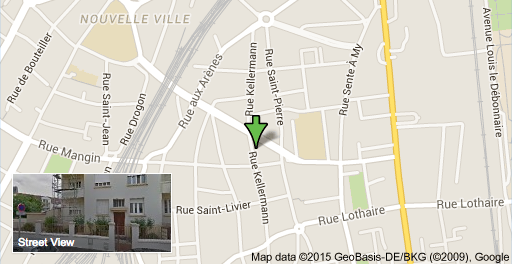 The same address that is mentioned in one of the letters by Mary von Rathen to Benoît Peeters and François Schuiten! In the Correspondances you find the address on page 10. But if she has something to do with these letters is still unknown. There are two more letters that Eddy Remy received from Mary von Rathen. These letters are also not dated and from the second letter the envelop is not saved either. Due to the content we assume this is the second letter. This letter is also two pages long. Or download the PDF scan of the second letter. We have asked Aloyzia_X to transcribe and translate also this letter. Tout d’abord, veuillez me pardonner d’avoir tant tardé à vous répondre mais c’est que, voyez-vous, votre lettre m’a profondément troublée. Premièrement, vous semblez ignorer l’existence de M.M. Schuiten et Peeters qui sont pourtant, à l’heure actuelle, les seuls qui parlent aussi ouvertement et aussi clairement du monde d’où je viens et dans lequel mon cher Augustin a disparu. Car il a bel et bien disparu et je suis certaine qu’il est mort. Cela veut donc signifier que vous avez eu connaissance d’Augustin et de l’univers nouveau qu’il a exploré, par un autre biais. Quel est-il ? Mais ceci n’est pas le moindre fait qui me trouble. Avant de parler du suivant, j’aimerais vous entretenir quelque peu de M.M. Schuiten et Peeters. Ces messieurs sont auteurs de bandes dessinées (moyen d’expression qui m’était, jusqu’à mon passage, totalement inconnu). Ils sont déjà passés dans mon monde mais, à leur grand regret, ne peuvent y retourner. En effet, le musée d’Augustin, à Laguiole, a été détruit après récupération des pièces le constituant. Il n’est donc plus possible de passer par là. Il existe cependant un autre passage. Ces messieurs se sont un jour égarés dans le dédale de couloirs du Palais de Justice de Bruxelles et se sont retrouvés dans le palais des trois pouvoirs de Brüsel. Mais cela ne s’est produit que par un pur hasard, et ils n’ont jamais pu découvrir la clef du passage. Il se trouve que monsieur Schuiten possède, au niveau graphique, la même trempe que mon cher Augustin tout en conservant des proportions plus réduites. Cela répond à votre interrogation. Mais j’en viens à mon second problème. Vous affirmez très clairement que vous allez de temps en temps à Brüsel voir les œuvres d’Augustin. Vous êtes donc allé plusieurs fois dans mon monde ! Par quel moyen ? Connaissez-vous la clef du Palais de Justice ? Y a-t-il d’autres passages ? N’êtes-vous toujours resté qu’à Brüsel ou êtes-vous allé voir les œuvres d’Augustin à la fondation Koelber ? Je vous en supplie, répondez-moi sur ces points qui me fascinent et m’empêchent de dormir. Dans l’attente impatiente de vous lire, je vous transmets mes sincères amitiés. First of all, please forgive me for being late answering, but you see, your letter deeply unsettled me. Firstly, you do not seem to know about the existence of Misters Schuiten and Peeters who however are, presently, the only ones talking so openly and so clearly about the world I come from and within which my dear Augustin disappeared. Because he definitely disappeared, and I am sure he is dead. This therefore means you have been aware of Augustin and the new universe he explored by another way. What is it ? But this is not the less unsettling fact. Before talking about the next one, I would like to let you know about Misters Schuiten and Peeters. These gentlemen are graphic novel authors (way of expression unknown to me until my passage). They already passed through to my world but, to their biggest regret, can not go back. In fact, Augustin's museum, at Laguiole, was destructed after recovering of its constituting pieces. It is then no longer possible to pass through there. Nevertheless, another passage exists. These gentlemen got lost one day in the maze of corridors of the Palais de Justice in Bruxelles and ended up in the Palais des Trois Pouvoirs at Brüsel. But this happened only by sheer accident, and they could never discover the passage key. Turns out Mister Schuiten owns, on the graphic level, the same strength than my dear Augustin while holding onto smaller proportions. This answers your interrogation. But here comes my second issue. You very clearly assure that you now and then go to Brüsel see Augustin's artworks. You therefore went several times in my world! By what mean ? Do you know the Palais de Justice key ? Are there other passages? Did you only ever stay in Brüsel or did you go see Augustin's artworks at the Koelber foundation ? I am begging you, answer me on these points that fascinate me and keep me from sleeping. Impatiently looking forward to reading you, I give you my regards. We do not know what Eddy Remy wrote to Mary von Rathen but from the reply from Mary we think somehow he denied to know François Schuiten and Benoît Peeters. This is strange as Eddy Remy was known to be a collector of the Obscure Cities. 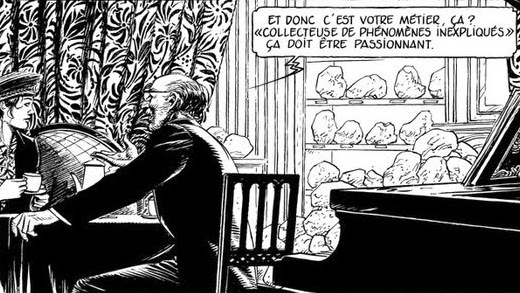 Why would he deny to know Schuiten and Peeters? And what about the second part of the letter? Did Remy find a passage to Brüsel? The mentioned sculpture is named after L'Enfant de Phœbus [The Child of Phœbus] a painting by Augustin Desombres. This name is only used in the Obscure World! In our world this sculpture is known as Samouraï, a resin and glass sculpture, made in 1987 by Christian Poincignon, from a set of original drawings by François Schuiten. The sculpture is very rare as only 100 copies were made. How would he know the Obscure Cities name for this statue? And what about the experimental treatment he got? Is he mentioning the Dersenvalisation by Ernest Dersenval, a doctor in Brüsel? “During my long stay to the hospital, my wife has sold and burned all what I've collected about the cities so that I forget my past and feel better”. So it was the wife of Eddy Remy who sold all of his collection of Ebay? For sure is that his wife plays also a part in the third letter. It is a long letter of six pages. 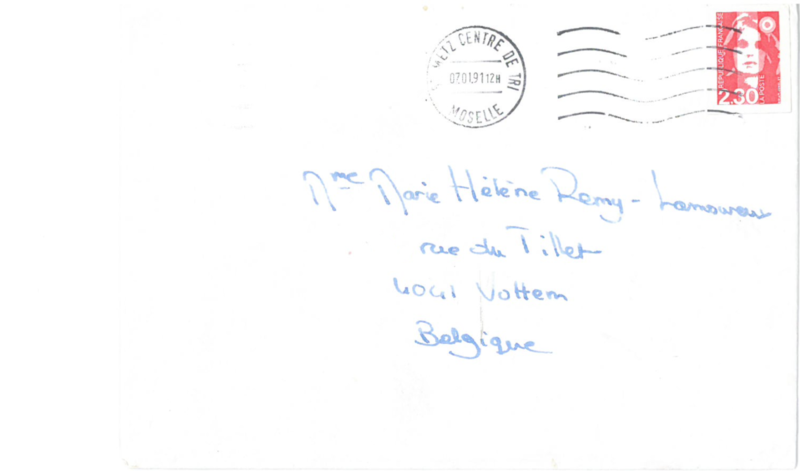 The letter is post stamped January 7, 1991 in Metz. The first letter had a return address in Metz! Or download the PDF scan of the third letter. Tout d'abord, je vous prie de bien vouloir excuser ce retard dû au fait que je m'étais absentée quelques semaines et je ne suis rentrée qu'avant-hier. Votre lettre m'a profondément bouleversée car j'imagine aisément ce que vous devez ressentir, puisque j'ai moi-même été dans cette situation d'attente, d'angoisse, d'espérance et de dépit, de résignation. Ceci, à la différence près que je savais où était l'âtre attendu. Mais je vous expliquerai cela plus tard. De prime abord, je tiens à vous mettre en garde. Cette affaire est d'une importance que vous ne soupçonnez même pas, et il ne faut absolument pas que cela s'ébruite car cela pourrait avoir des conséquences graves. Surtout ne mêlez plus la police à cela, je sais où se trouve votre mari ! A partir de maintenant, ce que je vais vous écrire vous paraîtra sûrement abracadabrant et issu du cerveau d'un romancier, sans doute trop imaginatif, et pourtant, il s'agit de la vérité ! Vous me dites que votre mari avait patiemment étudié les plans du Palais de Justice de Bruxelles et avait cru y déceler quelques anomalies. C'est tout à fait probable. Il se trouve que l'architecte de ce bâtiment, Joseph Poelaert, est le même qui a construit le Palais des tris Pouvoirs de Brüsel. Eh oui, encore ce nom qui vous est inconnu. Si vous cherchez sur une carte, vous ne trouverez nulle ville de ce nom, et pour cause, car cette ville ne se trouve pas en ce monde. Brüsel est une importante Cité d'un monde parallèle à celui-ci, sensiblement plus petit, constitué d'un seul grand continent. La vie s'y déroule tout à fait comme ici, sauf qu'il est, techniquement, moins avancé. Son temps correspond environ à l'extrême fin de notre XIXe siècle. Je sais que cela peut paraitre aberrant, mais je vous supplie de me croire. Je suis moi-même issue d'une des grandes Cités de ce continent: Mylos. Il se trouve qu'il existe, entre ce continent et notre monde, un certain nombre de “portes” ou de passages. Nous en comptons deux actuellement. Depuis, le musée d'Augustin a été rasé, condamnant à jamais le passage entre nos deux univers. La seconde “porte” se trouve chez vous, à Bruxelles, et précisément au Palais de Justice. Par là, on débouche dans le Palais des Trois Pouvoirs de Brüsel. Les seules personnes que je connaisse qui ont réussi à franchir le passage sont messieurs Schuiten et Peeters dont j'ai déjà parlé dans ma précédente lettre. Ils se sont perdus dans le dédale de couloirs du Palais de Justice et se sont retrouvés, sans trop savoir comment, dans le Palais des Trois Pouvoirs. Ils sont donc arrivés dans mon monde tout à fait par hasard et ne connaissent en aucun cas la clef qui permet de franchir la limite. De retour ici, fascinés par le peu de choses qu'ils avaient vues, ils ont entrepris d'en faire de la bande dessinée, “les Cités Obscures”. Joli titre, n'est-ce-pas ? Cependant, ils n'ont jamais pu retourner dans mon monde. Voilà ce qu'a découvert votre mari: la clef du Palais de Justice. Par quel moyen ? Je n'en sais rien. Mais peut-être a-t-il laissé quelques notes ou le plan de Joseph Poelaert. Je vous en prie, si vous possédez le moindre indice de ce genre (il n'a pas pu tout emporter ! ), faites le moi savoir ou envoyez-moi des copies… La découverte de votre mari est capitale ! Nous allons enfin savoir comment passer d'un univers à l'autre, je pourrais rentrer chez moi et vous ramènerai votre mari. Je vous en supplie, ne divulguez tout ceci en aucun cas, mais écrivez à monsieur Peeters, et racontez-lui tout ce que vous m'avez dit, il vous conseillera sûrement. Vous pouvez dormir tranquillement, votre mari est sûrement logé confortablement au “Chapon doré”, le meilleur hôtel de Brüsel. Ceci dit, je ne parviens pas à comprendre pourquoi il n'a pas donné signe de vie depuis bientôt 3 mois. Si j'arrivais à rentrer chez moi, je parviendrais sans doute à éclaircir cela. En attendant, je vous conjure de garder l'espoir, je vous soutiens cordialement. First of all, I beg your pardon for this lateness due to the fact I was absent for a few weeks and only came back the day before yesterday. Your letter deeply distraught me as I easily imagine what you must feel, since I also have been in this situation of wait, dread, hope and disappointment, of resignation. This, except that I knew were was the awaited hearth. But I will explain it to you later. At first glance, I would like to warn you. This matter is of an importance you do not even suspect, and it must not leak because it could have severe consequences. Above all do not bring the police into this anymore, I know where to find your husband ! From now on, what I will write you may seem bizarre and coming from a novelist's brain, probably too inventive, and yet, it is the truth ! You tell me your husband patiently studied plans of the Palais de Justice at Brussels and believed to have detected a few anomalies. It is most likely the case. It turns out the architect of the building, Joseph Poelaert, is the same who built the Palais des trois Pouvoirs at Brüsel. Oh yes, another name unknown to you. If you search for it on a map, you will not find any city of that name, and for good reason, as this city is not located in this world. Brüsel is an important Cité of a world parallel to this one, noticeably smaller, made of only one large continent. Life there unfolds exactly like here, except it is, technically, less advanced. Its time approximately matches our late 19th century. I know this can sounds absurd, but I am begging you to believe me. I do myself come from one of the big Cités of this continent: Mylos. Turns out exists, between this continent and our world, a certain number of “doors” or passages. We currently count two of them. The first one was in a village in the south of France, Laguiole, and more precisely in an old museum that a realist painter from the dawn of the century, Augustin Desombres, had acquired to host his frescos; Augustin had discovered the secret of the passage that lead into one of my properties, not far from Mylos. He was my lover and promised me to bring me with him into his world, meaning yours. But he always postponed the moment. And then one day, he left. Like you, I waited for him, but he never came back. On the other hand, after many years, coming through a system that would tedious to explain here, an auctioneer allowed me to join your world. Since then, Augustin's museum has been razed, sealing off the passage between our two worlds forever. The second “door” is where you are, at Brussels, and precisely at the Palais de Justice. Through there, you arrive in the Palais des trois Pouvoirs at Brüsel. The only people I know that ever passage are misters Schuiten and Peeters, of whom I already. Talked about in my previous letter. They got lost in the maze of corridors of the Palais de Justice and ended up, without really knowing how in the Palais des trois Pouvoirs. They therefore came into my world completely by accident and do not know the key that allows to cross the barrier. Back here, fascinated by the very little things they saw, they started turning it into graphic novels, “les Cités Obscures”. Nice title, isn't it ? However, they could never return into my world. Here is what your husband discovered: the key to the Palais de Justice. By what means ? I do not know. But maybe he left some notes or Joseph Poelaert's map. I am begging you, if you own any hint of this kind (he could not have taken it all with him ! ), let me know or send me copies… Your husband discovery is crucial ! We will finally know how to cross from one universe to another, I will be able to go back to my place and bring you back your husband. I am begging you, do not disclose anything about this in any case, but write to mister Peeters, and tell him everything you told me, he will surely advise you. You can sleep calmly, your husband is probably staying comfortably at the “Chapon doré”, the best hotel in Brüsel. That being said, I can not manage to understand why he did not give any sign of life over the last 3 months. If I went back to my place, I could probably shed some light on this. In the mean time, I beseech you to keep hope, I cordially support you. Trying to understand the reply of Mary we conclude that the wife of Eddy Remy replied on a letter of Mary. She told Mary that her husband had left and didn’t return yet. Somehow Eddy has found a passage to the Obscure world via the Palace of Justice in Brussels. Eddy Remy told us before he was in a hospital when Mary wrote his wife. Was this the same period when he left his wife? When we asked him if his is still involved with the Obscure Cities, he answered: “When I think about this period of my life, it's always with nostalgy, but I don't try anymore to get there (one visit there was enough for my balance …).” So yes, he has visited the Obscure World, but it didn’t do him any good. The image we got from Eddy Remy seems to be a screenshot from his computer. We did some research and tracked down the image. The image is taken in the Dutch city Maastricht. 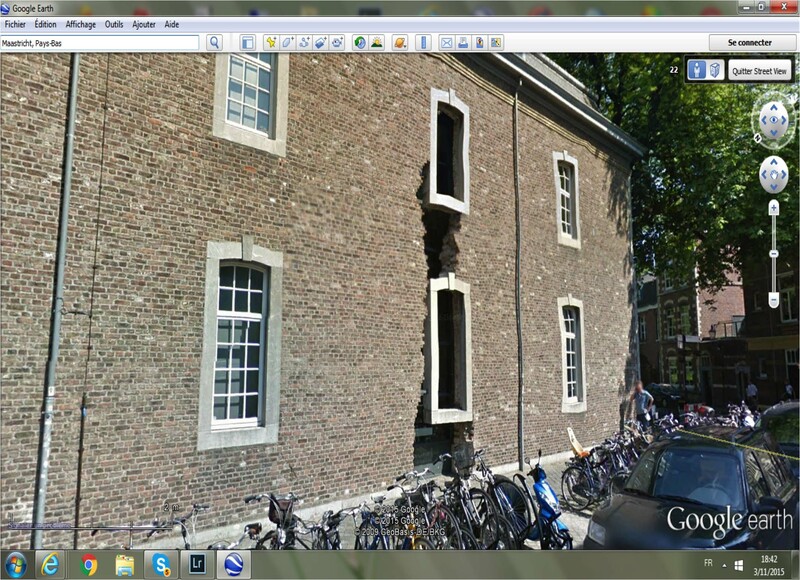 It is the facade of the office of the HCL (Historisch Centrum Limburg) 7). The wall was broken down here as a remembrance to the old city wall from the 13th century which was built here. There is a Latin text underneath the window: “Non sum qvalis eram” (I Am Not What I Used To Be) from Oden by Horatius (65-8 BC) 8). I Am Not What I Used To Be? Another hint by Eddy Remy about his time in the Obscure World? While researching the first ad by Eddy Remy in Le Soir we found another ad posted by Eddy Remy. The ad was published in Le Soir of March 7, 1992 9). Qui peut me donner des renseignements sur le peintre français Augustin Desombres (1869 - 1906) dont la maison musée qui se trouvait à Laguide (dans l'Aveyron) aurait été récemment détruite? Où peut-on voir ses oeuvres et quel est le mystère qui entoure sa disparition? It is unknown why Eddy Remy posted another request in the newspaper. Was he back from the Obscure Cities? Didn't he tell us, that he didn't want to discuss the Obscure Cities anymore after his hospitalisation? Then why did he post another classified ad? So we got three letters by Mary von Rathen to Eddy Remy. Sadly Eddy doesn't remember much anymore about these letters. But maybe the letters themselves can tell us something about the person who wrote them? Handwriting analysis or graphology, the generic term, has been with us for centuries. Even in an era of text messages and email, people still know how to write, and the writing still gives the truth. Graphology was first created by the Chinese over 3,000 years ago. It is not the hand that writes, but the brain. Writing is a complex neuromuscular process that begins in the pre-frontal cortex. As such, it is an accurate expression of what's going on inside the personality 10). We asked graphology expert Josephalexandr to make an analyse of the three letters. We asked two questions: are these letters written by the same person and what can you tell us about this person? “These letters were indeed written by the same person. I assume that the timing on these three letters were written at different times. Two of the letters have a slight slant so you can tell she was dealing with a sense of slight depression. The other letter that is more horizontal seems to have handled whatever issues that they were dealing with. This person follows the rules of society. He or she wasn't running away from something or towards something. They were very in the present. At times could be dominant and may have had a small secret. With this person what you see is what you get. They did not put on a mask when they were with someone and you can count on them being consistently the same person as when lets say when they were alone. Some would consider this person an introvert. They always had access to a high amount of concentration. They spent a lot of time inside their head. Some would say they were emotionally withdrawn. This person needed all the facts before making a decision. Many would consider this a great attribute. The may have been considered an introvert but when it came down to things were very blunt/straightforward. They had a fluidity of thought and didn’t have a problem speaking what they were trying to say. 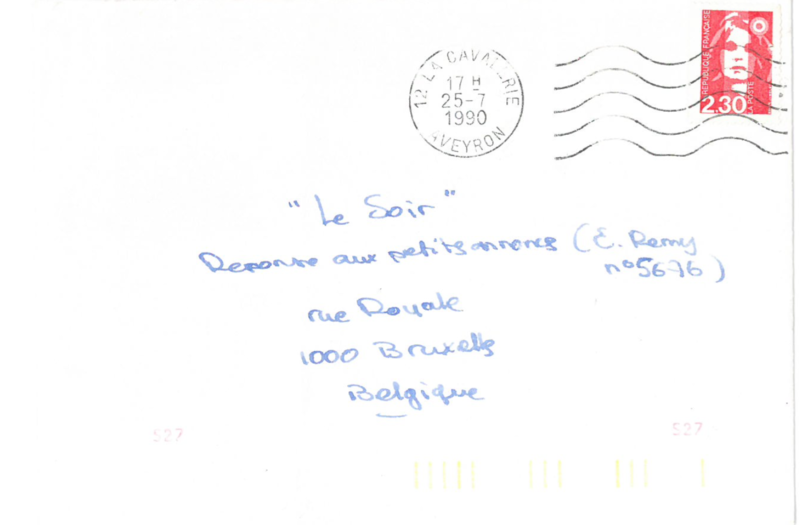 Also Benoît Peeters and François Schuiten received letters during the period of 1990. As Benoît Peeters explained this first letter he received was just after the exhibition Musée des Ombres. According to these letters Mary was living in our World and moved back to the Obscure World through a passage in Peru. Most strangely these letters were collected in a book called Correspondances. This book surfaced in 2003. The eight known copies of Correspondances were delivered in five distinct stages, all of them under mysterious circumstances. Since 2003 no other copies were found. When we confronted Benoît Peeters with the letters send to Eddy Remy, he mentioned the letters he received and were collected in the Correspondances book. He also send us seven emails he had saved. According to him these emails are part of the Correspondances, but we can not verify this as we have not seen the book in reality. The owners we know treasure the book too much to lent it or make a copy of it. This first e-mail dates back to January 8, 1997. Almost 7 years after the first letter to Eddy Remy. 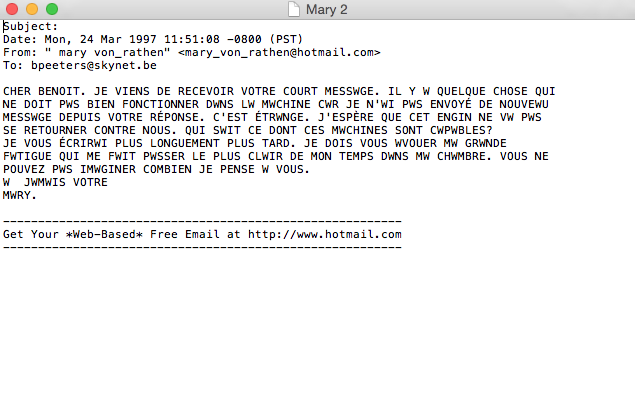 Mary is now using some kind of device that is sending emails to Benoît Peeters. As mentioned in the Correspondances book Axel Wappendorf made some kind of device for Mary to communicate with our world. It must this device that was used to send the emails. In the texts the A is replaced by a W. Curiously are AW the initials of Axel Wappendorf. When have replaced the W with A and had the message translated by shanikachp, we get the following message. Mary is telling that she trying to communicate with Benoît Peeters via this machine of Wappendorf. She isn't sure it is working and if Peeters will receive the message. Mary tells that he has been in a hospital for some time. I am not really sure if you can hear me and I have no idea about what I'm doing. It’s axel who made me sit me in front of a big typewriter, telling me that I could finally talk with you again. It had been a very long time ever since. I did write some letters from time to time, but I am not sure if you received them. It’s really difficult to stay here any longer, being far from you. For some time, I was admitted in the big Brüsel hospital. I am resting now, I have the feeling that I have grown too old and there’s nothing left apart from the emptiness. I was made to follow a special treatment. I let them do what they wanted. After all, I really don't care. Once, I even saw you. Did you know that? I had a vision of you. Did you get my letter? I am torn between my world and yours, I don’t know who I am any more. In my rare moments of well-being, I read, walk, write and try to recall what I really went through. What did you feel about us after returning from your journey, was it so difficult to you as it was for me? At the beginning, things were going fine; it was only later on that I had a terrible blow. Talking to you through a machine that I am not sure even if it’s working properly, worries me a lot. Axel is overwhelmed with this new invention of his. I don’t understand him. He is so old and with such an overflowing vitality, I have the feeling that he’ll never die. But if you can hear me, or read me, please forgive me, pressing these keys exhausts me heavily, I think I’ll close my eyes for a while. Write back ………. At last. The replies by Benoît Peeters are not saved. So we can only provide the messages by Mary von Rathen. Her second message arrives at March, 24 1997. She thanks Benoît for his reply. She found out that she cannot reply via the machine. So she wrote a new message. Mary complains about feeling tired all the time. I just received your brief note today. There is something wrong with the machine because I didn’t send any new message ever since your reply. This is strange. I hope that this machine won’t turn against us. Who knows what these machines are capable of anyway? I will write you at length next time. I must admit that my great weariness makes me spend most of the time in my room. You have no idea as to how much I think about you. The third email arrives a few months later. The translation by shanikachp tells about Mary being away to the Green Lake. The air is doing her well. But she has also dreamed strange dreams. Dreams about her meeting Benoît Peeters, but that is was prevented by the shadows of Peeters. It was the album L'Ombre D'un Homme that had its prepublication on the Urbicande website by then. It’s been some time after I really wrote to you. I have just returned from a short visit to the seashore, which certainly did a world of good to me. The fresh air, far from the huge cities seems more pleasing all the same and I miss the green lake, which I had not seen for a very long time. I thought I’d have some news from you, once I returned, but nothing. I’ve got to tell you about the strange dream that I saw not very long ago, cradled by soothing sound of waves: it was a neutral place, a sort of a big room with distant walls. You were in its middle, only on a chair. I slowly came close to you and you gave me an object: it was a portrait of me, the one that you had asked from me when I used to live in Metz and where I eventually ended up. You were glancing at the portrait and suddenly, you took out a knife from your pocket, and started ripping it violently. I was scared of you and could not move. Then a man’s shadow appeared out of nowhere (François?) who tried to stop you from moving. You fought with this shadow but he was much stronger than you and finally, he tore you apart with your own knife. This is when I realized that it wasn’t really you, but a doll filled with scraps of paper who bore your look. Getting much nearer, I noticed that they the letters that I had been able to send you, cut into a thousand pieces. What do you think about it? You must surely have a friend who could analyze thoughts and the behavior of people. And you must have talked to him about me already, I can feel it. Will you speak to him about this dream? Frankly, have I gone completely mad? P.s: I am getting so much better. Kind regards to François. 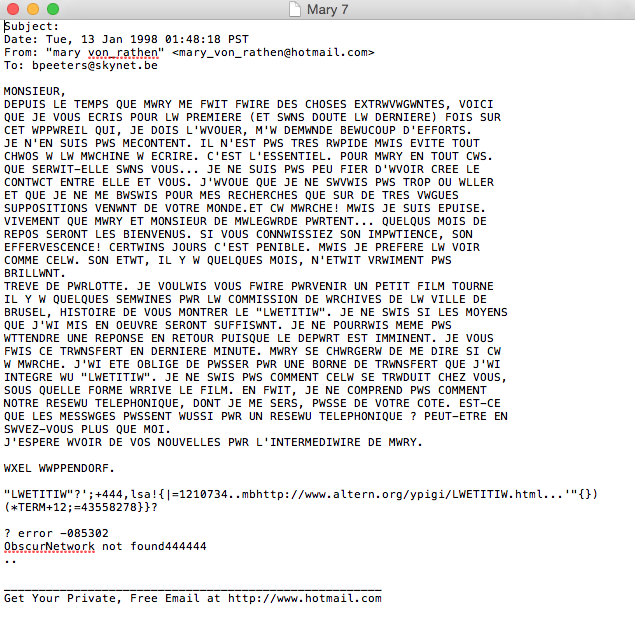 In this email Mary indicates that she lived in Metz. Metz, the city related to the letters to Eddy Remy. The fourth email received by Benoît Peeters is dated November 5, 1997. 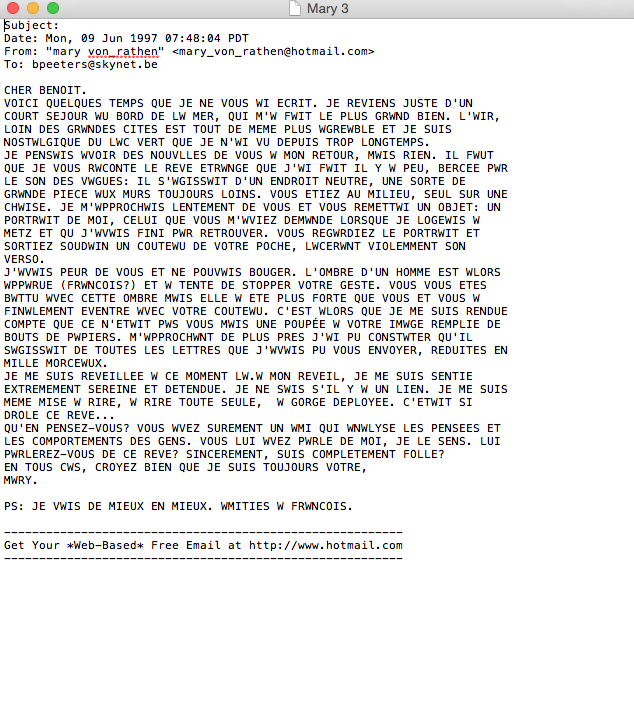 According to this email, Axel Wappendorf is making a change to the machine that lets Mary communicate with our world. She is still in a hospital in Brüsel. It’s been several weeks after I really wrote to you. I must tell to you that Axel has done some modifications to the machine that he had built himself. His project is to mount it on wheels and add an engine to it, so that I can go anywhere with it. But all I really need is to be able to connect myself to the telephone network so as to be able to talk with you. I don’t intend to stay in Brüsel for a very long time. I am gradually getting much better. I met another patient at the hospital. We got on together really well and it’s likely that this meeting is really helpful to my healing. As you can see, I am trying to reintegrate into my world, to forget you …….a little bit. My wish is that there’ll still be a little corner in me, filled with all your memories. Tell me how you are getting on. I will write you a longer letter next time. Another email receives on December 4, 1997. Mary tells that she is moving far away from Ypigi together with De Malegarde. The preparations for the journey took us a lot of time and I wanted to write to you much earlier than this. I embark on this voyage with such a sense of excitement. It's been quite a while since I’ve travelled and without Malegarde, I certainly won’t be having the courage to advance into such an adventure. This is a long journey. Ypigi is very far and I still don’t know why Malegarde wishes to go there. He is indeed very mysterious. But I have decided (as his guest) to follow his lead. It keeps me active. Ever since my return, I feel somewhat mistimed and I doubt that this feeling might quickly become blurred. Maybe it’s an escape……most certainly. This journey suits me just fine. I wrote a word to my family. Only my mother could get around and say goodbye to me. I don’t have much to think about them lately. For the time being, axel is working on the final retouches of the device which he built for us. It’s not very elegant but the inside is rather practical and comfortable. It looks a little like the military vehicle at your place, with caterpillars. He explained to me that it was to avoid a lot of havoc. I must also add, that the machine that lets me talk with you looks very delicate. There are also living rooms, small, but offers enough comfort. Lord malegarde takes care of our ride, the pathway, the stopovers……. I still have no idea about the intervening regions. I trust him though. He seems to be very sure of himself. He doesn’t speak much but I feel he’s satisfied with my presence. Perhaps, I must also be helping him, to finally embark on this journey that he had always discarded. I am leaving you now. I have to go. We must complete the machine that we might need. The six email arrived a day later on December 5, 1997. Mary is wondering if her emails gets to Benoît. Did you receive a letter from me, these last days? Axel states that there must have been a problem. I had not exactly seen him servicing the machine that enables me to talk with you. This is so silly, since for once, I really wrote you a long letter. And if you had not received it, I will write you another. The last email is from January 13, 1998. For now this is the last known email. 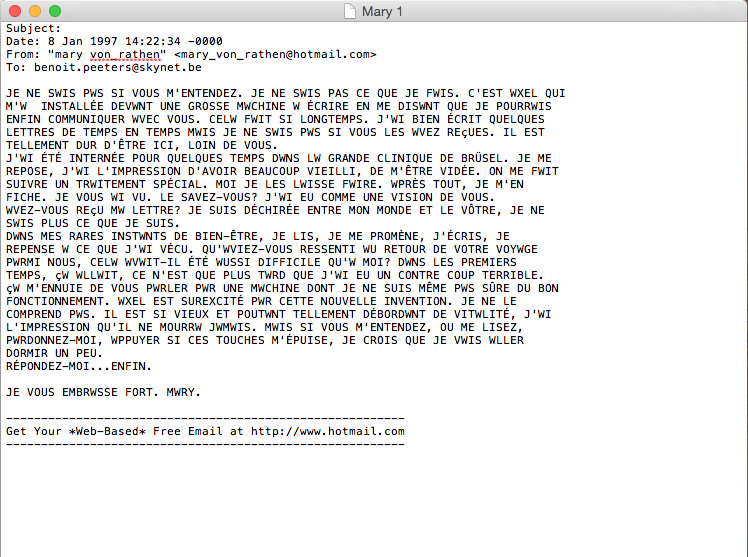 The email is not written by Mary but by Alex Wappendorf. After replacing the A & W we get the following translation by shanikachp. Ever since Mary had made me do extravagant things, I am now writing to you for the first (and certainly the last) time from this device which, I must admit, required a great deal of effort from my part. I am not dissatisfied with it. It’s not very fast but avoids all sorts of havoc in the typewriter. This is the essentiality. At least for Mary. What would she be without you………. I take some pride in having created this contact between her and you. I admit that I really don’t where to go and that I base my researches only on very vague suppositions coming from your world. and it works perfectly! But I am exhausted. Deeply that Mary and Lord malegarde are leaving……. some months of rest will be most welcome. If you only knew her impatience, her excitement! Certain days it’s almost painful. But I prefer to see her like that. Her state, a few months ago, was not very brilliant. A chin-wag truce. I wanted to send you a small movie clip run several weeks ago by the commission of archives of the Brüsel city, just to show you the “laetitia”. I am not sure if the ways and means that I’ve implemented will be sufficient. I couldn’t even wait for an answer in return since the departure is imminent. I am writing this to you in the last minute. Mary will take action to tell me if it’s working alright. I was compelled to pass it through a transfer strip which I have integrated to the “laetitia”. I have no idea how it’s interpreted there, or in which form the film might come to you. In fact, I don’t understand how our telephone network, which I use, work on your side. Do messages also pass through a telephone network? Perhaps, vous’d be knowing more than me about this. I hope to hear more news from you through Mary. A part of an url can be recognized. The full url is not found anymore on the internet. Also the Wayback Machine doesn't has this page in its archive. Altern.org participated for twenty years to make the right to freedom of expression a reality for citizens and residents of France. Due to changing regulations they have closed the community website in 2000 12). At the time of closing there were 21,893 sites that existed on Altern.org 13). We contacted Valentin Lacambre, the founder of Altern.org, but we got no reply. Laetitia is the device that Mary uses to travel. It is also the name of one of the 16 geomantic figures are the primary symbols used in divinatory geomancy. Each geomantic figure represents a certain state of the world or the mind, and can be interpreted in various ways based upon the query put forth and the method used to generate the figures 14). Latin for “Joy”. The figure resembles an arch, fountain, or rainbow. It is good in situations that concern potential, joy, or happiness. Astrologically it is associated with Pisces and Jupiter retrograde. It is ruled externally by water, but inwardly by fire. It is a positive figure for nearly all questions, representing fast situations and construction. It indicates upward motion, happiness, or joy. Its planetary intelligence is Iophiel and its spirit is Hismael; it is associated with the deities Jove and Neptunus, and the angels Sachiel and Barchiel. It is associated with the feet 15). Happiness and joy is what Mary is after while traveling. See also The Laetitia. Laetitia was also part of the stage name Mary used while she was part of the Robertson Circus. Was is also a happy period for her? A first attempt for a timeline. It seems that the letters in the Correspondences book is covering the 1990-1996 period. Without a copy of the book we are not sure. Exhibition Le Musée des Ombres in CNBDI. 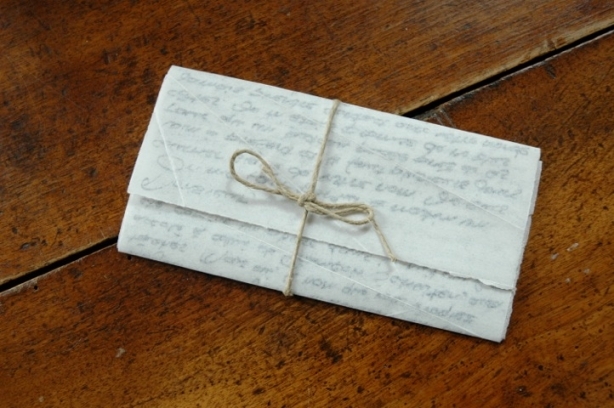 A new letter by Mary von Rathen to mr. Védrine? During September 2013 France Culture broadcasted a documentary on traveling to the Obscure Cities. In the second episode of this documentary a mysterious letter was found. The letter was written by Mary von Rathen. Is it from the same source as the other letters? See: Letter by Mary von Rathen. We can provide a transcription of this letter by Mary to mister Védrine thanks to Sylvain St-Pierre, he also made the English translation. On me fait parvenir ce matin courrier signé de votre nom. Je suis loin à présent et il faut plusieurs jours pour qu’un bateau passe près de ces côtes. Je m’étais promise de ne plus jamais prendre contact avec votre monde. Le « Laetitia » ayant été remisé pour de bon, pour mon plus grand bien, il m’était impossible d’avoir le moindre lien. Mais voilà, l’évocation de ce seul nom : Peeters, aura suffi. Et je vous envoie donc ce mot en espérant qu’il saura trouver un chemin. Cette époque, pas si lointaine, fut pour moi la plus intense et la plus trouble qui soit : mon passage dans votre monde et les quelques mois que j’y ai vécu, contrainte par l’impossibilité de revenir. Ce ne fut pas facile croyez-moi, et j’ai dû m’abaisser aux pires tâches. 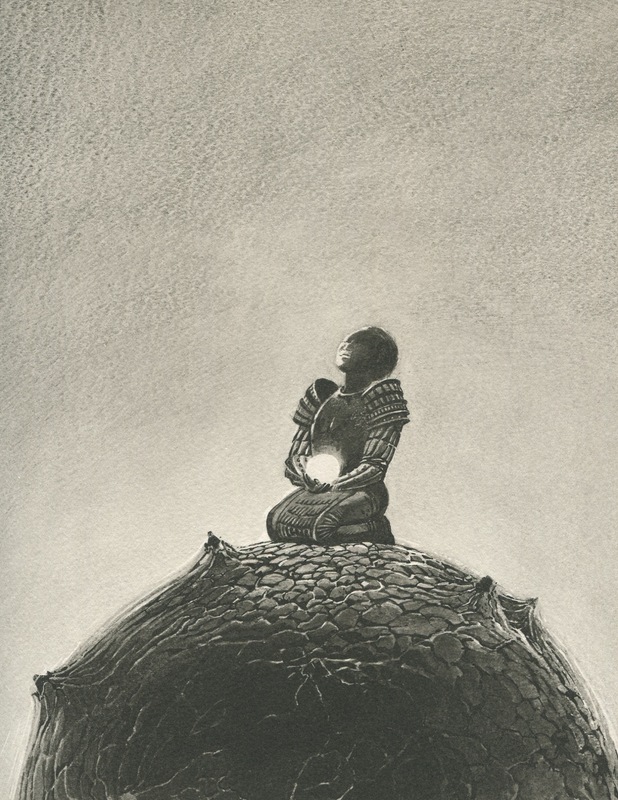 Mais oui, la note que vous évoquez accolé à celui de François Schuiten, aura été comme un phare dans la nuit que fut mon séjour chez vous. Je ne sais plus comment j’ai pu rentrer. Des hommes, je crois. Des messagers sont venus me prendre. J’en garde aujourd’hui un souvenir confus. Une précipitation. Une course. Une porte violente. Je ne m’étendrai pas sur mon expérience de ce retour, ni sur les mois qui suivirent, si vous me le permettez. Bien sûr cette expérience a développé en moi une acuité particulière. On me prêta des dons que je n’avais pas. Des savoir-faire inconnus… Absurdité… Puis ce fut une autre lumière, celle de Malegarde. Et le long périple pour traverser toutes ces terres en sa compagnie et celle d’Axel. Vous voyez, je n’ai pas grand-chose à vous raconter, somme toute. Depuis que je suis à Ypigy, ma mémoire s’est quelque peu effacée. Tout se brouille. Ne restent que quelques images furtives… Quelques noms. Augustin bien sûr… Benoît et François… Vigoleis Koelber… Frédéric Young… Wilbur Leguebe… Roman… Une chose cependant. Ce qui me pousse aujourd’hui à vous écrire. Je vous vois curieux comme beaucoup de vos semblables. Vos amis le furent en leur temps. On vous parle de villes insensées, de personnages extravagants, et d’histoires fascinantes… Mais personne ne vous parle de douleur, d’absence et d’impossibilité. On ne « passe » pas indemne, on laisse toujours un peu de soi. Que croyez-vous? Que vos amis publient pour leur plaisir? Qu’ils se divertissent à broder des romans? Ils publient car ils ne peuvent faire autrement. Ils publient pour tenter de se raccrocher aux bribes qu’ils ont gardées de cet unique passage qui fut le leur. Ils publient car ils savent qu’un peu d’eux-mêmes est resté ici et que depuis tand [sic] d’années ils sont au bord d’un abysse dont ils ne peuvent évaluer le fond. Ils sont à la pire place : celle du seuil… Ni d’un coté… [sic] ni de l’autre… Ne faites pas l’expérience du passage, Monsieur Védrine, je ne la souhaite à personne. Gardez-vous bien de chercher toute porte. Il en existe partout, parfois plus proches qu’on ne le pense. Et la tentation est grande, à condition que l’on connaisse la clef. Votre monde est terrible et beau. Le mien l’est davantage. Après tout ceci, on ne peut vivre sereinement qu’à un seul endroit. Précisément là où je me trouve. This morning, a message signed with your name has been handed over to me. I am far away now, and it takes several days before a ship draws near these shores. I had promised myself that I would never again initiate contact with your world. The “Laetitia” having been put away for good, much for my own good, it was impossible for me to establish the slightest link. But then, the evocation of that one name : Peeters, has been enough. So I am sending you this note, with the hope that it will find its way. That era, not that far away, was for me the most intense and troubled that can be: my passage to your world and the few months I lived there, forced upon me by the impossibility to return. It was not easy, believe me, and I had to lower myself to the worst labours. But yes, the note that you mention attached to that of François Schuiten has been as a lighthouse in the night that was my stay. I no longer know how I manage to come back. Men, I believe. Some messengers came to take me. Today, I keep only a confused memory of it. A rush. A race. A violent door. I will not elaborate on that return, or on the months that followed, if you will so allow. Of course, this experience has developed in me a peculiar acuity. I have been attributed gifts that I did not have. Some unknown know-how… Absurd… Then, there was another light, that of Malegarde. And the long trek to cross all those realms in his company, and that of Axel’s. You see, I do not have all that much to relate, in the end. Since I arrived at Ypigy, my memory has faded somewhat. Everything is getting blurred. Are left only a few vanishing images… A few names. Augustin, of course… Benoît and François… Vigoleis Koelber… Frédéric Young… Wilbur Leguebe… Roman… One thing, however. What incites me today to write to you. I perceive you as being curious, as so many like you. Your friends were too, in their days. You hear about nonsense cities, extravagant people and fascinating stories… But nobody is mentioning the pain, void and impossibility. One does not “pass” unscathed, we always leave a bit of ourselves behind. What do you believe? That your friends publish for their own pleasure? That they enjoy weaving novels? They publish because they cannot do otherwise. They publish to try to revive the fragments they have kept of that one single passage of theirs. They publish for they know that a little of themselves stayed here and for so many years they have been tottering next to an abyss that they cannot gauge. They are in the worst of places: the threshold… Neither on one side nor on the other… Do not try to experience the passage, Mister Védrine, I do not wish it on anybody. Avoid looking for any door. There are some everywhere, sometimes closer that you think. And the temptation is great, provided that you know the key. Your word is terrible and beautiful. Mine is too, and more. After all this, one can live serenely in but one place. Precisely where I am. In the opinion of Sylvain St-Pierre is the author not the same person who wrote the original letters from the Correspondances book: the style is much weaker and there are several spelling errors. There are even hints that this may have been written by a male unaccustomed to use female-specific French grammar. 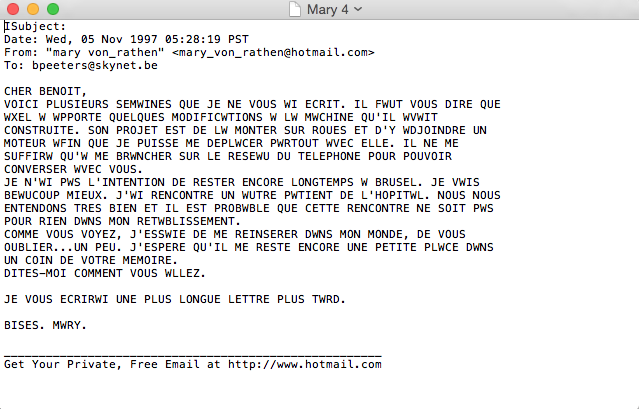 Although we were able to research a lot with the letters to Eddy Remy and the emails we got from Benoît Peeters, Mary remains a mystery. We were still not able to answer all questions. The Correspondances book might give more answers, but without a copy of the book we can only guess. on what date was the add posted by Eddy Remy? 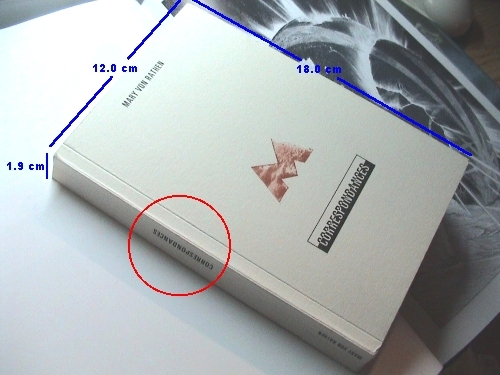 the Correspondances dossier also mentions Metz as local address. Is there a connection? are the emails to Benoît part of the Correspondances book? Or separate? Who is living on the found address in Metz in 1990? What happened with the remaining copies of the Correspondences? Does the Correspondances cover the 1990-1996 period? What happened between 1998 and 2003? Why did Eddy Remy posted another ad in 1992? If you can help let us know! We appreciate every piece of information, how small it might seem.